MKG Bio Alchemy’s creations evoke the healing benefits of plants while promoting harmony with nature and our environment. Marrying the sciences of botany and biology, MKG formulations harness the intelligence of the earth itself, with the belief that plants are master communicators capable of delivering phyto-nutrients, vitamins, antioxidants, and trace minerals to the skin, feeding our internal garden and promoting homeostasis - the state of internal balance that makes life possible. The herbs, flowers, roots, fruits, and resins that make up these proprietary formulas are sourced from farms and distilleries around the world with an eye towards sustainable growth practices, mindful cultivation and extraction, and reverence for the cultural traditions that have dictated their use for centuries. 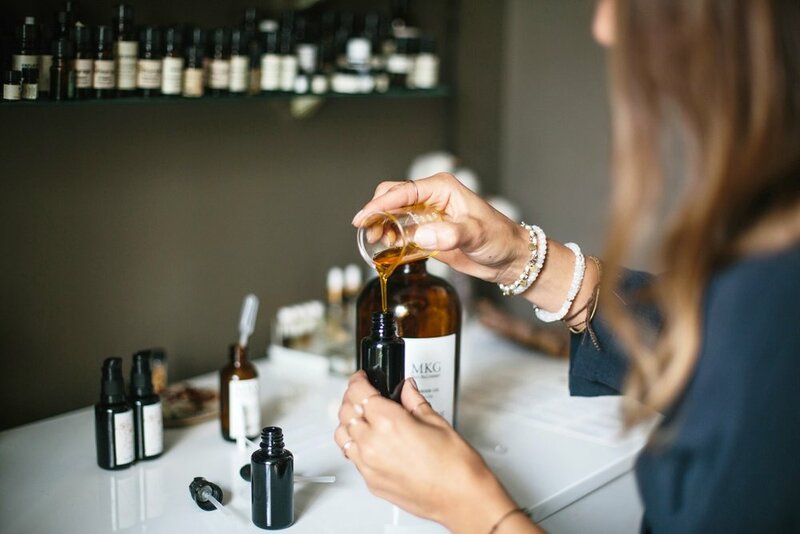 All formulations are crafted in small batches and hand poured into Miron violet glass bottles to maximize the longevity of their living ingredients.